The first half of the analysis is the data cleaning steps performed in Vallejos et al., 2015 to reproduce the steps performed in Islam et al., 2014. 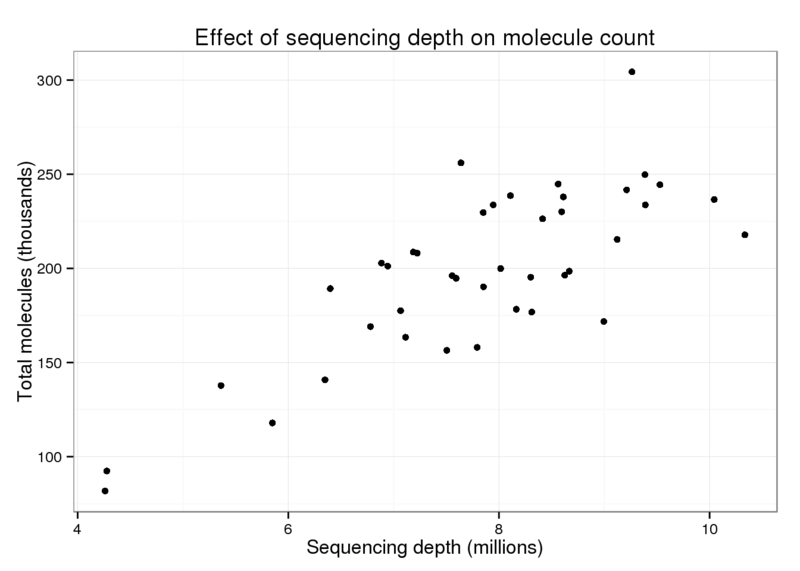 In the second half I compare the total molecule counts from this clean data to the sequencing depth per sample to determine if there is still a relationship between sequencing depth and total molecule count. This document shows the code used when illustrating the use of BASiCS by analysing the mouse ESC dataset described in Islam et al (2014)1. To start the analysis, the following data must be dowloaded and stored in data.path directory. Expression counts. File ‘GSE46980_CombinedMoleculeCounts.tab’ from Series GSE46980. Quality control information. File ‘187_3lanes_CA.txt’ (provided by Sten Linnarson). Input molecules of spike-in genes. File ‘SilverBulletCTRLConc.txt’ (provided by Sten Linnarson). # BASiCS only needs to import the generic functions, not the associated methods. Counts is the matrix of expression counts. The first column in Counts contains the identifiers for each of the 25914 transcripts and the remaining columns contain the observed expression counts for each of the 96 cells in the sample. Cells contains cell identifiers for each of the 96 cells in the sample. These identifiers are required in order to combine the quality control information. # Excluding 4 spike-in genes that are not part of the ERCC molecules. Current processed data contains 25910 genes and 96 cells. The next step is to remove those cells that did not pass the quality control criteria employed by Islam et al (2014). Current processed data contains 25910 genes and 41 cells. The next step is to remove those transcrips that are very lowly expressed. Current processed data contains 7941 genes and 41 cells. Finally, we need to re-arrange the data such that the expression counts are at the bottom of the table. Final processed data contains 7941 genes (7895 biological and 46 spike-in) and 41 cells. 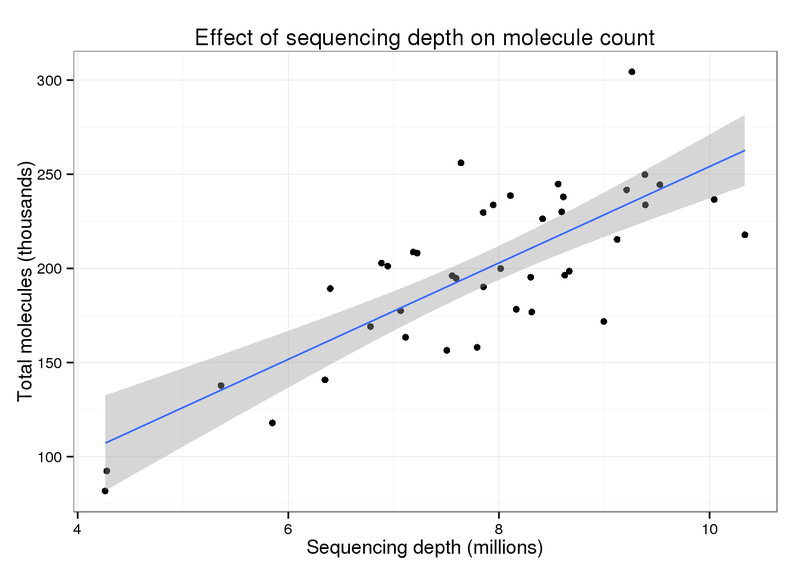 Is there still an effect of sequencing depth on total molecule counts using the cleaned data? Import the total reads that were previously counted from the raw fastq files. They used the well as the identifiers. Luckily since the columns were organized by well, I can easily add them. The counting iterates by column first (numbers) and the row (letters), e.g. “A01, B01, C01,…, F12, G12, H12”. Calculate the total molecules counts. Filter the total reads using the well ID. There is still a trend of more total molecules with increasing sequencing depth. For every additional 1 million raw reads, a sample has ~25.6 thousand more molecules.